The Northern Lights series from Fallkniven offers a knife which can be described as the utmost quality as a chopper but which also provides a sleek and rather beautiful appearance. No expense has been spared to create a knife which is as beautiful to observe and as comfortable to use as possible. The NL1 is surely a pleasure to look at and a thrill to use. 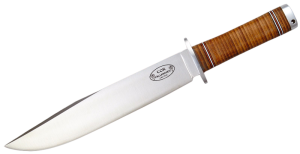 The F1 comes with Fallkniven’s latest invention as regards the blade which is of the laminated VG10 variety. The edge is made out of the now legendary VG10 steel while the sides of the knife are made of the strong 420J2 steel. This combination is without question the best around since it combines all the properties which are conceivable and desirable in one fell swoop such as resilience, edge durability and resistance to torque – all these are found in a single blade. The 7mm blade is outwardly strong enough for most tasks but with the laminate technology used on it, you can expect at least 20 per cent more strength in its resistance to bending when compared to any other VG10 blade. This ensures that this blade has qualities which no other knife manufacturer can ever offer. Those who have used a chopper knife know that it is designed for heavy duty use and as such, it makes considerable demands on both the blade as well as the handle. The handle of the F1 is made out of a hugely original fabric which is ox hide, something which is mostly overlooked by other manufacturers but which gives an incredibly strong and rugged grip. The material ages quite beautiful and with the passing years it acquires what can be described as a brown patina which is extremely attractive. Moreover it is unaffected by solvents and oils and is completely resistant to water. Some dryness may cause what are known as glimps on the handle but these disappear when the knife is once again put to use. The F1 blade continues Fallkniven’s philosophy in persisting with the convex edge since it is known to be the ultimate combination of edge strength as well as cutting performance. This blade can only be made by hand and as such the F1 is different from almost all other knives which are usually mass produced and certainly do not have that kind of edge. Most knives today are made with an automated process which keeps the costs low but you can never achieve the perfection of a handmade blade by using mechanical methods. The F1 is really a top drawer corrosion resistant knife which is the ultimate in edge durability and design. It is a fact that a machine can never come close to the subtle craftsmanship of a trained and skilled knife smith. The NL1 is named after the strongest and most powerful God, Thor, the ruler of the Aesir’s domicile and the Asgard, the strong red-bearded God of Thunder.